Exercise And Eat Well To Live Longer And Healthier! We provide illustrated examples of exercise and workouts for endurance, strength, flexibility and balance. If you are like me, you are addicted to your fitness program. You are addicted because you enjoy feeling healthy. You enjoy feeling stronger and more energetic. You enjoy that flatter stomach and muscular body. You enjoy looking good! When I first became serious about developing a fitness routine for my home gym and weight training workouts, I had to search many sites to find the right examples of workout procedures. That is why I created this website. You can save time and effort by using this website to find the illustrated examples of Endurance, Strength, Flexibility and Balance Workouts, all in one spot. You can use the Navigation Bar on the left side of each page to find the examples that you need for your Physical Fitness Program. In the Workout Routines Section you can find links to information on the Benefits of Exercise, a discussion of Overweight Health Risks, which includes a Body Mass Index Calculator and a Workout Calorie Chart, and the Recommended Workout Programs. Also make sure to visit our Online Store to find stylish and funny workout related T Shirt designs. In these workout examples, you can find ideas for your home exercise program, endurance training, ways to build muscle, increase your longevity, maintain a healthy life and ways to develop senior health programs. Live a Longer And Healthier Life! We should do 30 minutes of moderate intensive aerobics 5 times or more each week. This is the conclusion of a 27-year Aerobics Center Longitudinal Study conducted by The Cooper Institute. And those over 65 also need to include strength training and flexibility workouts, according to the Recommended Workout Program by the American Heart Association and the American College of Sports Medicine. What Is Moderate Intensive Aerobics? As a general rule, it is when we are slightly breathless but can still talk with little effort while walking or running. Israeli researchers put previously sedentary 85-year olds on a 4-hour a week workout program. Their 3-year survival rate doubled that of inactive 85-year olds, according to a study led by Dr. Jeremy Jacobs. It's never too late for us to start. Want To Reduce Your Risks Of Alzheimer's Disease By 60%? We should become physically active and eat a Mediterranean style diet. This is according to a study conducted by Dr. Nikolaos Scarmeas and colleagues at the Columbia University Medical Center. Eating healthier and being more active are the ways that have made me leaner and meaner. When I now go to the grocery store, the majority of my time is spent in the fresh produce section. And I really enjoy finding new vegetables and fruits to try. I find myself eating less and less meats and more and more fruits and vegetables, and thoroughly enjoying the experience. A proper diet and good nutrition combined with staying physically active is the key to a healthy life and increased longevity! Visit the Online Store for our full line of Designer T Shirts. Does Brain Training Improve Cognitive Abilities? 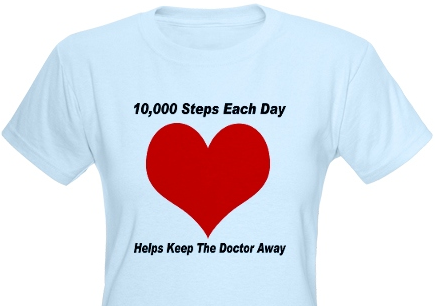 The Exercise Blog is a way to keep my readers informed of recent Exercise and Health Articles. The adult exercise routine recommended by the American Heart Association, and the 5 Components of Physical Fitness are discussed in detail. The best abdominal exercises as defined by a study conducted at the Biomechanics Lab at San Diego University are discussed - Illustrated Examples. These simple balance exercises help prevent the likelihood of falls as we age. These workouts help us to remain active and independent in our senior years. Bicep Exercises help you maintain the ability to pick up and carry things like children, groceries, books or your briefcase. You will also look great! Dumbbell Exercises are an easy way to perform strength workouts. They are inexpensive and efficient. Home gym equipment for your exercise and fitness routine needs. Flexibility Exercises are an important of physical fitness. It allows your joints to bend repeatedly without injury. Leg Strengthening Exercises work the largest muscles in your body - Illustrated Examples. Triceps Exercises are great for maintaining the ability to lift yourself up from a sitting position. These workouts firm those muscles in the back of your upper arm. The Five Tibetan Rites can be used as Flexibility Exercises - Illustrated Examples. The exercise equipment Online Store is partnered with Amazon.com to provide the best selling items. Our Link Partners provide additional resources for the development of your exercise and fitness program. The Site Map for Exercise-To-A-Healthier-Life.com helps you find the right exercise routine for your fitness program. Contact Us about exercise questions, suggestions, comments or advertising. Would you like to share your knowledge about Exercise? Great, find out how you can submit your story or tip here.